Our IndiePulse Music Magazine’s Exclusive Artist Introduction and Interview with Dylan McCarthy of McCuna about their style, messege and music. Up and fast becoming popular hip-hop group McCuna from Buffalo, NY have just released a new song and companion video for their humorous yet self insightful track “Butter”, the video for this, and their other videos, available to view on their YouTube Channel, have a smooth style with a humorous appeal, much like the stylings of Will Smith a.k.a Fresh Prince, their music is infectious and give you reason to smile. In Review: The Video for “Butter” by McCuna is fantastic, fun and free of some of the typical violent or radical harsh imagery that is commonly associated with the genre of music which started as a new form of expression, and with McCuna, it expresses a desire to live and enjoy life, to find the good in the self and in the world. “Butter” is super smooth, all natural, chemical free and good for your health, just roll in it, slather it on and get a wholesome greasy on ya! IndiePulse Music got a chance to speak with Dylan McCarthy about the group McCuna and their music. IPM: So, Tell our readers about yourself, where did you get your start and what is your vision as to where you want to take your Music? My best friend Josh Luna and I created a alternative type hip-hop group called McCuna. Josh and I, both from Buffalo, NY, have been friends since we were around 4 years old and music has always been one of our passions. We started making music together when we were around 12 years old, then got more serious with it at the end of high school. We feel like we bring something different and unique to the table, so we’d love to take this to the next level. Josh and I produce, direct, write, edit, and record all of our songs and videos ourselves which we feel like not many people do now-a-days. We also try to incorporate real instruments in our music that we play ourselves. I play piano and drums, and Josh plays guitar and drums. Together we really just want to continue creating because that’s what we’ve always loved to do. IPM: Let’s talk about your newest release, and the video for “Butter”, what inspired it? It’s funny, I wrote BUTTER in like 20 minutes. I was watching The Evolution of Hip-Hop documentary on Netflix and I rediscover Big Daddy Kane. That night I listened to his song ‘Smooth Operator’ like 5 times in a row and just started writing to it. 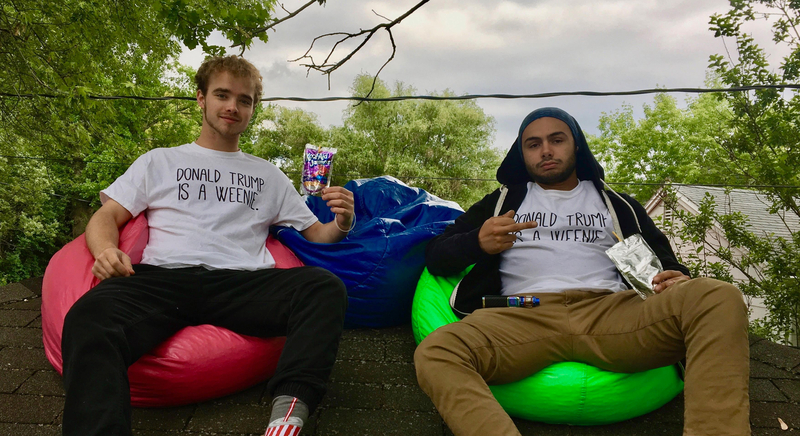 Then for the video we just wanted to show off the “Donald Trump is a Weenie” t-shirts that we made in the video and just have fun. It was cool. IPM: Looking at your videos and listening to your tracks, you have a Will Smith / Fresh Prince feel, do you find inspiration in the work of other artists that seek to inspire positive lifestyles? Absolutely. But first of all, let me thank you for the comparison to Will Smith. That might be the best compliment I’ve ever received (hahaha). Anyway, The Fresh Prince and KYLE are two of our top influences when it comes to hip-hop. Both of their music puts out such a happy and positive vibe, which is always what we shoot for when making music. Outside of hip-hop we also take influence from artists like John Mayer and The Beatles. IPM: What are some of the ideas that come into your music, do you have any “political” or “Social commentary” tracks? We haven’t really talked directly about our political views in our songs, although we point hints at it in our videos. For example in our latest song “BUTTER” we all wore shirts that we made saying “Donald Trump is a Weenie.” Not only is it true, it looks sick on a T-Shirt. Other than poking fun at it, we don’t have any interests in politics. Social Commentary is what really gets my ideas flowing. We talk about problems such as people not living life to the fullest (Stay Young), kids today playing on there phones and not playing outside anymore (outside. ), and being comfortable in your own skin/ self-confidence (KEWL.). IPM: Whats next for McCuna, and where can our readers find your music? Moving forward, we are going to continue to create and put out content that we love and have the most fun making. We have several new songs/videos planned to come out during the summer and hopefully we can start to create some sort of buzz. Any readers can easily find our music on our Youtube Channel or our Soundcloud account. If you are interested we are selling the “Donald Trump is a Weenie.” shirts you saw in the video! Please check it out, thanks for reading and feel free to contact us at any of our social media accounts.